The Congress has been mounting a relentless attack on Modi, alleging that his government has been systematically damaging various institutions. Modi's comments are seen as a counter to the charges on the principal opposition party. 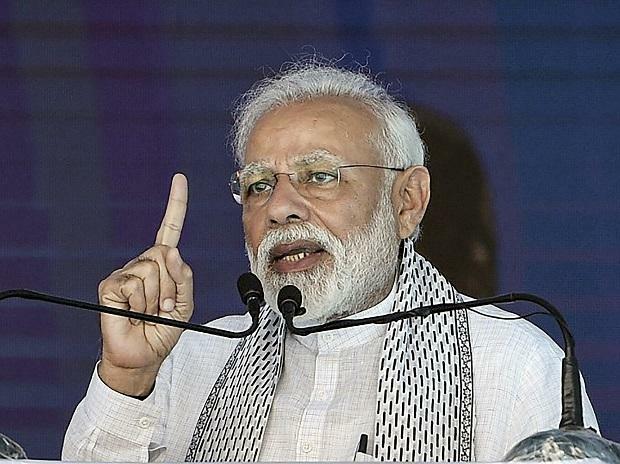 In a blog post, Modi also urged people to think wisely before casting their vote in the Lok Sabha polls even as he referred to Emergency and instances of imposition of President's Rule in various states by Congress governments at the Centre. Asked to react to Modi's attack, Congress general secretary Priyanka Gandhi Vadra told reporters in Mirzapur in UP: “The PM has attacked every institution in this country for the last five years, including the institution of which all of you are a part." In his blog post, Modi said one family's desire for power cost the nation dearly and that people should remember this while casting their votes. “As you go to vote — remember the past and how one family's desire for power cost the nation so greatly. If they could do it then, they can surely do it now,” Modi wrote. "Think wisely: From the press to parliament. From soldiers to free speech. From the constitution to the courts. Institutional insult is the Congress way," Modi wrote. "Everyone is wrong, only the Congress is correct," he added. Reacting to his "dynastic politics" jibe directed at the Gandhi family, senior Congress leader Kapil Sibal said the PM himself comes from the Sangh Parivar without whose blessings no one in the country can occupy any public position. "No one in the BJP can occupy any public position without the support of the RSS. The Sangh Parivar is the biggest parivar in the world. Without their blessings no one can hold any public position in the country, be it the position of a PM, a minister, governor or chief ministers," Sibal told PTI. Referring to parliamentary proceedings, he said, "The nation knows the numerical dynamics of both houses. It is clear that when a non-dynasty party [has a] higher number, its tendency to work more is visible ... which were the forces disrupting the House and why." Discussing the freedom of expression, the prime minister alleged that dynastic parties have never been comfortable with a free and vibrant press. "A tweet against the son of a powerful UPA minister could land innocent citizens in jail ... the nation watched with horror when a few youngsters were arrested for expressing their true feelings at a programme in Karnataka, where the Congress is sharing power," he said. Modi said he wants to tell the Congress that "no amount of intimidation" will change the ground realities. "Curbing freedom of expression will not change people's poor impression of the party." Referring to Emergency, he said it was imposed to "safeguard" the interests of a "dynasty". Referring to the judiciary, he alleged that Congress' contempt for courts "is anyway legendary". "It was Mrs. Indira Gandhi who called for a 'committed judiciary', which seeks to make the courts more loyal to a family than to the Constitution," he claimed. "In a telling comment, former Prime Minister Rajiv Gandhi called the Planning Commission led by Dr Manmohan Singh, 'A bunch of jokers'," he said. "A policy decision taken by no less than the Union Cabinet was torn into pieces by someone who was not a member of any ministry and that too, in a press conference," he said, in a reference to Rahul Gandhi tearing a copy of an ordinance which sought to overturn a Supreme Court ruling on immediate disqualification of a lawmaker upon conviction. Referring to defence preparedness, Modi alleged, "After 1947, every Congress government has seen multiple defence scams. They began with jeeps and then moved to guns, submarines and helicopters. Every middleman is linked to one family."